I am almost always called out of the line at airport security for a “random screening.” Statistically, it can’t be random. I suspect the fact that I’m traveling with a bunch of kids who don’t share my last name has something to do with it, as my stature and demeanor aren’t really that menacing. It takes an extra few minutes, and I quietly accept the punishment for never having legally changed my name. It was totally worth it. During the first 25 years of my life, I frequently had this conversation: “What’s your last name?” Schwedes. “What?” It’s Schwedes, pronounced Shway-dis, and spelled like Schweppes, the tonic water, but you’ve got to drop one p and then flip the other one upside down. As you can imagine, whomever I was talking to would lose interest early on. It’s a German name and one that I don’t really relate to. Aren’t the Germans supposed to be precise and tidy and smart about their finances? There’s no way I’m more than a tiny bit German. When a man named Monaghan proposed to me, you’d better believe I said yes in a hurry. I never spell it. No one even asks me to. I don’t care if the silent G makes it in there or not. Pronounce it Moynahan if you want, I couldn’t care less. 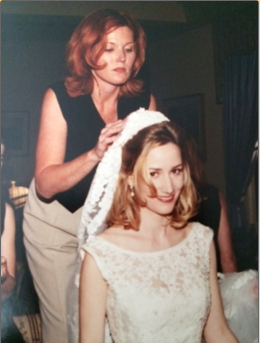 With a quick “I do,” I became Irish and easy to deal with, like I always should have been. I know a few things about beer and potatoes. And I don’t really tan. It didn’t take long before I had children with names like leprechauns and I started decorating my house for St. Patrick’s Day. My poor Spanish grandmother (other side) hardly recognizes me as the matriarch of this family. So with all this enthusiasm for my new heritage, you’d think I would have legally changed my name on the first day. I actually meant to. I’m generally an all-in sort of person, particularly where my family is concerned. Changing your name can be a touchy topic, particularly among women who have established themselves in a career. They feel torn between giving up their hard-earned reputation and making things confusing. I had neither of these concerns. I wasn’t exactly a world-renowned anything before I was married. In fact I dreamed of all the things I could accomplish if I didn’t have to spend the day spelling my name to people. But there was something about giving up my quirky tonic water name that didn’t sit well with me. It might be that the paperwork overwhelmed me, or maybe that deep down I thought it was sort of unnecessary and off balance. My husband wasn’t changing his name, so was this marriage thing really more of a transaction than a union? And if I changed my name for good, where would that younger self be? My solution was to keep that younger self and give her all of the hardworking German stuff to deal with. Miss Schwedes is listed on a marriage certificate, three birth certificates, a tax return and a mortgage. She’s got a lot of problems and probably an ulcer. But as consolation she’s virtually un-Googleable, so if she was mean to you in middle school (sorry!) and you feel like getting a little revenge, you won’t find her. Half of her has shuffled off her German coil and is hanging out at the pub. I’ve given all the fun stuff to the Irish lass. She’s decidedly more laid back, has lots of friends and does a job she really likes. She has no debt. She doesn’t even have a medical history, so I imagine she’s in pretty good health. I believe this is what they call the luck of the Irish.